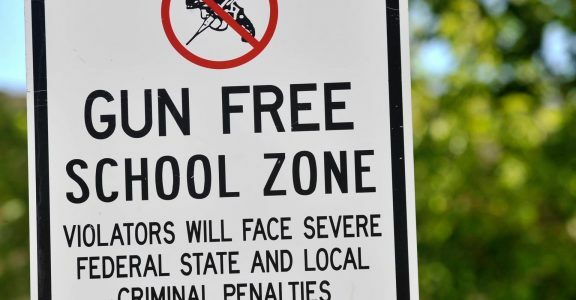 How long have we had “Gun Free Schools” in the United States? Did Bill Clinton’s Gun Free Schools Act and Zero Tolerance produce the results that we were promised? The Professor has a homework assignment for you. Our SWAT Fuel Warrior of the Week has a question about the 2nd Amendment to the United States Constitution. Does 2A only cover firearms or all arms? What difference does that make. Also, during our weekly Quiet Time segment from SilencerShop.com, Paul has some suggested reading for you. Are you kids prepared and do they know what to do in an emergency? TOPIC: Does 2nd Amendment cover more than just “guns”? A year after President Clinton called for zero tolerance of guns in the schools, 47 states and the District of Columbia have enacted laws or policies complying with the United States Education Department’s mandatory suspension of gun-carrying students. And although the policies are helping to reduce violence in the schools, it remains a problem in parts of the country, Secretary of Education Richard W. Riley said yesterday. Mr. Clinton signed a bill a year ago, known as the Gun-Free Schools Act, requiring that states adopt policies to expel for at least a year any student who brings a firearm to school. States would face loss of Federal money if they did not pass such policies within a year. Even though several states, and local entities, had such policies in place before the Federal law was enacted, Mr. Riley said the strong message from the President had helped to bolster other local efforts against violence in the schools. He said that in Dade County, Fla., which recently enacted an anti-gun policy, the number of guns seized in schools went down to 110 in the 1994-95 school year from 193 the previous year. In the Detroit public schools, 35 guns were seized in 1994-95, compared with 81 the year before. Mr. Riley, who spoke at the Fletcher Johnson Educational Center, a public school in southeast Washington, D.C., said that only three states did not yet have policies, but that all appeared headed in that direction.